The Frederator Studios Blog: Portraits. Postcards, Series 5. My Life as a Teenage Robot. Postcards, Series 5. The winners! The Nicktoons Film Festival. 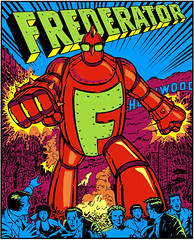 The Frederator Robot. Postcards, Series 5. My friends. Postcards, Series 5. Craig Kellman (left) and Carlos Ramos (right) are two of the greatest artists I've known. Craig was reviving the art of the Flintstones at Hanna-Barbera when he dashed off this card to me in the mid-90s. He had forgotten about it when I asked his permission to use it in our postcard series and asked we drop his credit, assuming the sketch was sub-standard. As if! (Luckily, he reconsidered when I sent it over.) Craig is the creative producer/supervising director of Foster's Home for Imaginary Friends at Cartoon Network. On Oh Yeah! Cartoons alone, Carlos created Twins Crimson and A Boy & His Dog, designed ChalkZone, and even designed the Oh Yeah! logo. And he's got the best color sense of anyone I've seen. This informal portrait is from a good-bye card my colleagues put together when my family moved from California in 1999. Young Carlos has created a beautiful series for Nickelodeon, called The X's. 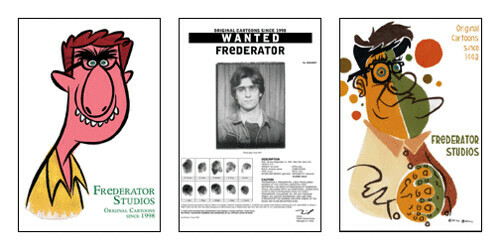 The wanted poster is adapted from a picture booth shot from 1977. Click here to see all our Frederator card series from the past seven years.